Shows are generally every 2nd Friday at the JCCSF at 3200 California Street from 8:00-9:30 pm. All past shows have filled up. We recommend buying tickets in advance. Tickets are $10 in advance or for JCC members, and $12 at the door. HGShow@SXSW Monday, March 12: Continuous Partial Attention: Leading tech thinker Linda Stone coined the term to describe the way many of us live. What is worth our full attention? How do we give it? For how long? Join Heather and guests at her 11th SXSW appearance for this special show. Each guest, leading indie geeks, musicians, filmmakers and attention cultivators will join Heather for as long as it takes them to drink one beer. Guests include Justin Hall, Ryanne Hodson, Micki Krimmel,Lane Becker (Satisfaction), Derek Powazek (8020 Publishing and JPG Magazine), yoga teacher and feminist p*rnster Liz Belile and filmmaker Doug Pray ( Big Rig , Scratch ). Creativity: pioneering industrial designer and creator of Corning Ware Sarah Little Turnbull, Bubbe Fritzi and her rugelach recipe and singer-songwriter Chuck Prophet. Trust: technology thinker Jerry Michalski, musician Ian Rhett, my then-therapist Rachelle Goodfriend who has counseled couples for over 20 years. Intimacy. More than love and desire, it eludes us. Why? Guests: Comedian and survivor’s rights activist Betsy Salkind ( The Tonight Show , writer for Roseanne ) author/spoken word artist Michelle Tea (Rose of No Mans Land, Rent Girl) and Derek Powazek, leading thinker+creator of online community (Design for Community, fray). Inheritance: How do we find and value the past in the present? Guests: Vintage painting and object curator Rob Delamater (Lost Art, former Creative Director JDV Hospitality), Jill Slater (apartment therapy editor, co-founder of New Amsterdam NY’s first sustainable, regional market + professional hora motivator) and Anthony Marshall, creator of pioneering hip hop showcase and MTV show Lyricist Lounge (Biggie Smalls, Slick Rick, Mos Def + Sean “Puffy” Combs). Receiving: Is it always better to give than receive? Why is it sometimes harder? Guests: NY-based conceptual performance love artist Kathe Izzo who loves people in her work presented in galleries worldwide (Wild Gift/London, Artemis/Miami, Highways/ LA) and ex-NFL Tight End and filmmaker Dr. Jamie Williams (SuperBowl champion with the San Francisco 49ers, Any Given Sunday) and Shanan Carney (aka the Voice of TiVo) whose debilitating knee surgery is teaching her first hand about the art of receiving. Her friends’ surprising generosity has sparked her own upcoming videoblog about random acts of kindness. Everyday Courage: How do we remember and stand up for our principles in everyday challenges, whether that means saying no to a business deal, going the men’s bathroom or taking another step? Guests: Antoun Nabhan (Principal, Sagamore Bioventures), a venture capitalist who invests in pharmaceutical companies, punk legend and queer/trans leader Lynnee Breedlove, (lead singer from Tribe 8, author of Godspeed and director of its upcoming film adaptation) and Elijah Riek, one of the “Lost Boys of Sudan,” who walked from Sudan to Ethiopia and then to Kenya on foot to flee war. He is now a student as USF. Outside In: What allows people access to each other and places that they’d never otherwise go? What is gained by the outside/in perspective? Guests: Corporate hacker and hacking fan Bradley Horowitz (Creator of Yahoo Hack Day, VP of Product Strategy, acquirer of flickr, upcoming.org), undercover satirist and author Harmon Leon ( The Infiltrator: My Undercover Exploits in Right Wing America , The Jamie Kennedy Experiment , OJ Simpson’s Juice’d ) and Rhodesa Jones, award-winning Founder and Director of the Medea Project: Theatre for Incarcerated Women. “When is the next one? !”—Audrey F.
“I leave thinking ‘hmmm’ as I reflect upon the rich, and relevent to my life conversation!”—Adee H.
“So rare to experience a live conversation of this nature—exploring issues of modern-life real people.”—Lisa G.
Baked goods and intimacy. What more could you want from a Friday night? Unlike traditional talk shows, the guests engage each other and the audience. No one is there to sell anything or has pre-scripted their conversation. We are actually talking about what we care about most. The Heather Gold Show mixes thinkers, entertainers, doers and the audience with humor, curiosity and a little soul. The Heather Gold Show was inspired by the Shabbat Salons I held in my home for eight years. Read this short history to find out more about how the show came to be. If I believe in anything, it’s baking. Be part of the show! Email me. 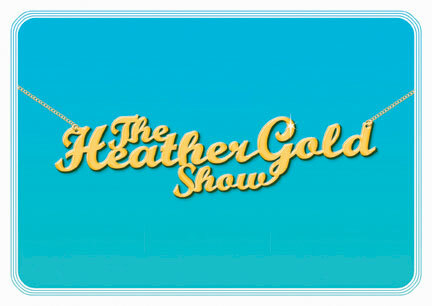 The Heather Gold Show was developed in association with the Jewish Community Center of San Francisco.